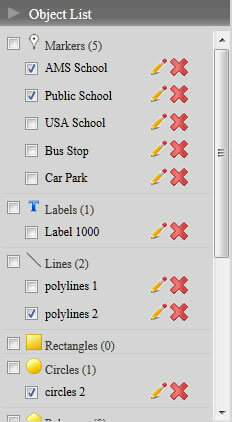 To edit more than one objects (markers, polylines, labels, polygons etc.) properties at once. First select the objects that you want to edit in Object list. In the properties panel (at the bottom of the editor), It will show the objects properties which can be edit. Edit objects properties in properties panel. Title Change the titles for all selected objects. - Change the website url for all selected objects. - The website url can be opened in either a New Window or the Same Window. - P.S. The info box will not pop up in the map when you fill in the url address in this area unless you select "mouse over" to show the popup box. Assign selected objects to different Category ID or unassign it (unassign the category ID means the marker will always be visible in the map). The selected markers' icon can be changed to different styles and colors. Please click "Change Icon"
- Text information/description can be filled in this text area. - HTML mode: Use <br /> if you wish to insert a new line. All others HTML tags (e.g. <a> <strong> <em> <img> <p> <h1>-<h6> <ul> <ol> ) are supported. - Preview mode: Use this mode to see your tag is correct or not. Roll Over: when the mouse rollover this marker, the info box will pop up automatically. Mouse Click: when the mouse click on this marker, the info box will then pop up. The Border width can be change to be thinner or thicker. Change the opacity to prevent other word/image from being covered. 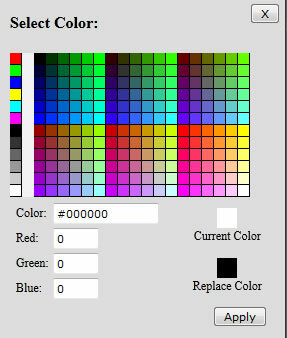 Change colors from a color picker with pantone no. Change color opacity of the selected objects. Change color of the selected objects.